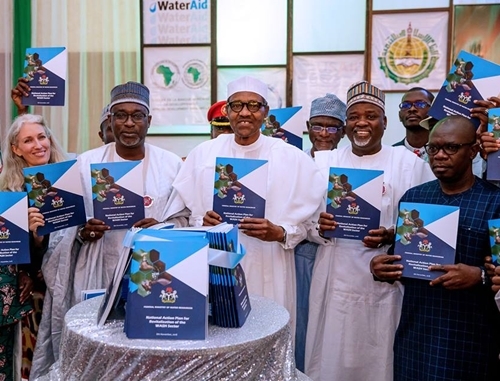 President Buhari has on Thursday, launched the National Action Plan for Revitalisation of the Water Supply, Sanitation and Hygiene (WASH) sector in State House. The President described statistics on open defecation, access to piped water services and sanitation in the country as ''disturbing'', warning that henceforth, Federal Government support to State Governments will be based on their commitment to implement the National WASH Action Plan in their respective States and to end open defecation by 2025. ''Access to piped water services which was 32% in 1990 has declined to 7% in 2015; access to improved sanitation has also decreased from 38% in 1990 to 29% in 2015. ''Our country now ranks No 2 in the global rating on Open Defecation as about 25% of our population are practicing open defecation. ''WASH services at the rural areas are unsustainable as 46% of all water schemes are non-functional, and the share of our spending on WASH sector has been declining from 0.70% of the GDP in 1990 to about 0.27% in 2015 which is far below the 0.70% at the West African regional level,'' he said. ''However, these are not being given the required attention judging from the high prevalence of water-borne diseases that are being reported in different parts of the country. ''We cannot and will not continue to allow these preventable occurrences to decimate our population,’’ he said. ''The Sustainable Development Goals (MDGs) targets (6.1 & 6.2) for WASH are even more demanding as they require WASH services to be provided in adequate quantity and quality on premises at affordable prices. ''This cannot be achieved if we continue with 'a business as usual' approach. ''It is on this premise that I fully endorse the decision taken at the meeting of the Federal Executive Council in April this year to declare ‘a State of Emergency on our WASH Sector’. ''I call on all State Governments to complement this effort by according the sector similar recognition to enable us work together to achieve the SDG targets for WASH by 2030,’’ he said. According to him, this is being demonstrated through faithful implementation of the Economic Recovery and Growth Plan (ERGP) - which is the present administration’s blueprint for infrastructure and economic development. ''From the inception of this administration, we have demonstrated serious commitment to the development of the Water Sector by preserving the Ministry of Water Resources and subsequently approving the 15-year roadmap developed for the sector. ''The transformation being witnessed in the sector since then is highly commendable. ''I have no doubt that the on-going initiatives including the implementation of the Partnership for Expanded Water Supply, Sanitation and Hygiene (PEWASH) in the Ministry will take the water sector to improved performance and supply, thereby meeting the national aspirations as well as the SDGs,'' he said.